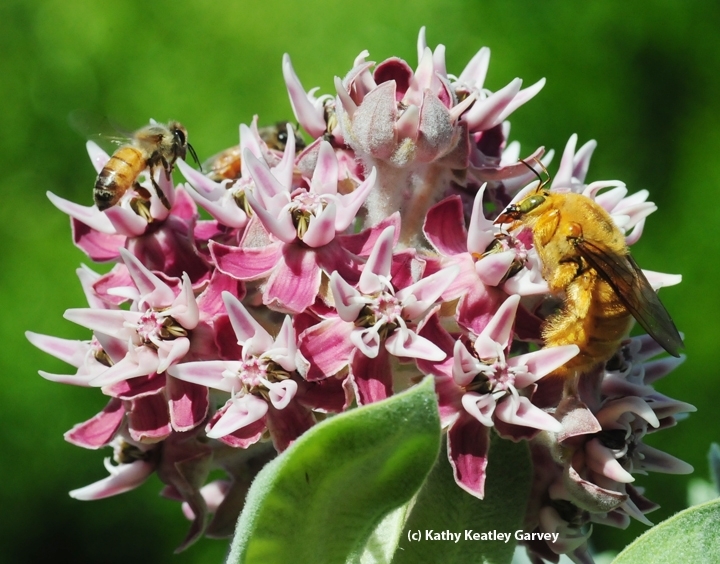 Got Milkweed? Bees Like It, Too! 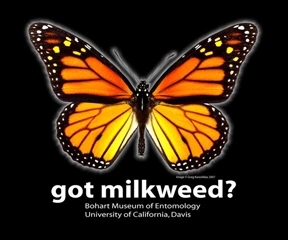 The Bohart Museum of Entomology at the University of California, Davis, stocks a "Got Milkweed?" t-shirt in its gift shop. 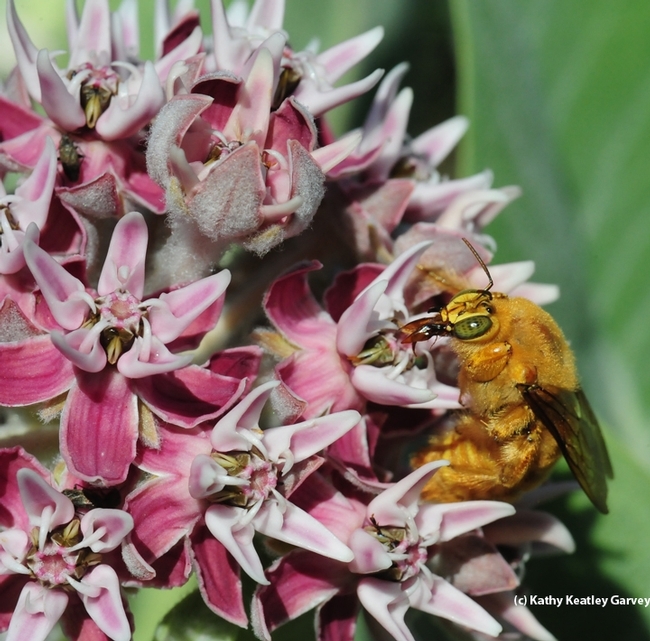 In real life, insects "get" milkweed. 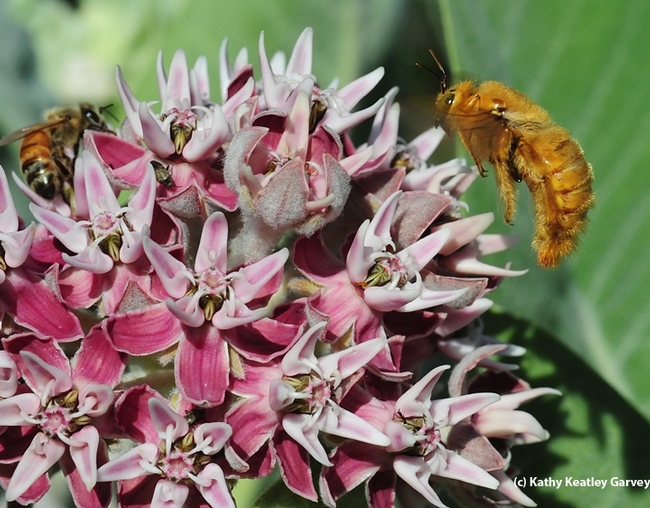 We all know it's the only host plant of the monarch butterfly--where monarchs lay their eggs--but it's also a a great source of nectar for butterflies and other insects. Take the showy milkweed, Asclepias speciosa. 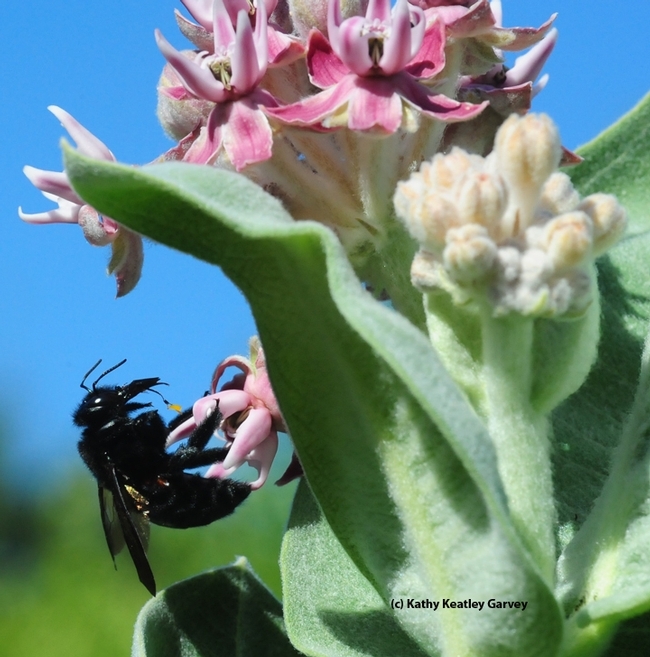 Native to California, it is found throughout North America, including in our little pollinator garden! Speciosa nectar is sweet, tantalizing and irresistible. Recently we've been watching the diversity of insects gathering on our milkweed. Sometimes it's a pushing/shoving match or I'll-fly-away-but-I'll-be-back-as-soon-as-you-leave vow. Have you ever seen a male Valley carpenter bee, Xylocopa varipuncta, nectaring on milkweed? The male, a green-eyed blond about the size of a queen bumble bee, can't sting. Or as native pollinator specialist Robbin Thorp, distinguished emeritus professor of entomology at UC Davis says--"Boy bees can't sting." He calls it "the teddy bear bee." What could be more cuddly than this little fellow? So here's this teddy bear bee trying to grab some nectar while honey bees are buzzing around him trying to get their share. He's bigger; they're louder. And then, the female of this Valley carpenter bee species (she's solid black--the two represent a clear case of sexual dimorphism) comes along and the bees scatter. Our boy bee does, too. The bees will be back. The nectar is sweet, tantalizing and irresistible. Was this photographed in the Arb on the plants by Environ. Hort? Thanks. I took these images in our little pollinator garden in Vacaville, Calif. It's rare for the male Valley carpenter bees to visit. I've seen them on our honeysuckle, milkweed and African blue basil, but mostly the milkweed.